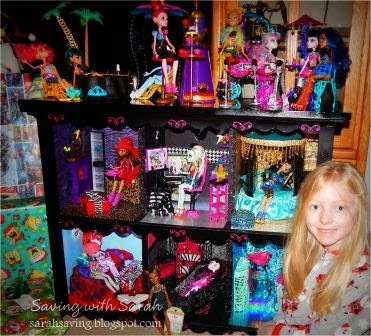 Santa elves finished up this Monster High Dollhouse just in time for Christmas (with a little help from me of course - and yes, I was a little stressed out about working with Santa on this project!) There were a few little extras that didn't get done; laptop, cork board, fish tank and closet. But, hey - there are always birthdays! My daughter was so excited when she realized that the bedrooms light up! So here we are with finished dollhouse. As you can see from the photos my daughter was very excited on Christmas morning! This project was very affordable. Many of the items are hand made (and pretty easy too), the unit itself only cost $5 from a local garage sale! 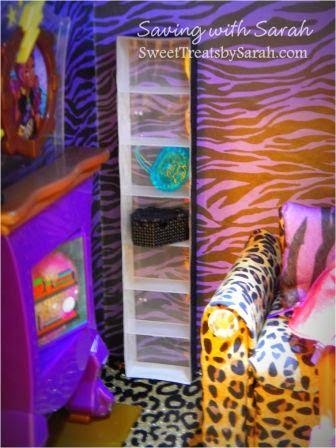 The base has wooden dividers added for each room, is wallpapered in a variety of scrapbook papers and fabrics, and there is a battery operated light in each room on the ceiling. You can read more about how we got started here. I "winged-it" on most of these projects. 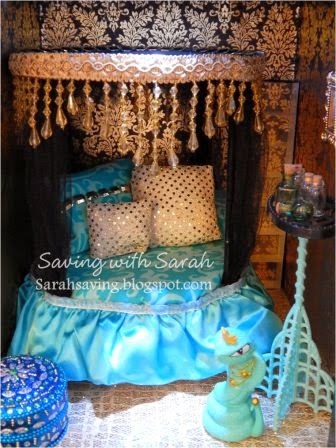 I was inspired to make a canopy bed after seeing this listing on Etsy (I wouldn't judge you if you bought one pre-made, this was by far the most difficult.) Since I wasn't really sure where to start, I used this free bed tutorial by Chad Alan as a guide. A few differences; I used heavy duty straws for the bed posts and added cardboard at the top. Also, the mattress is actually the soft foam covered in fabric so it is more realistic and squishy. If you watch my video here, you can see when I push down on it. Little extras: The small beaded box in her room came from Michaels Craft Store clearance section and the itty bitty bottles on her table are from the Hobby Lobby (I removed the screws). My husband made the TV and DVD Player (remote and DVD too) out of cereal boxes (for real!) following this tutorial from MyFroggyStuff. 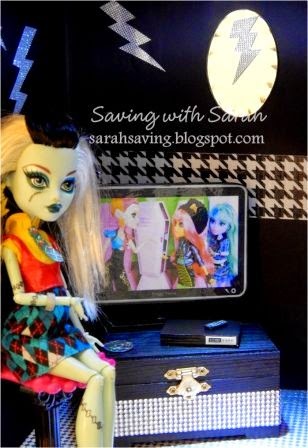 She has seriously cool tutorials available for all types of dolls - you MUST CHECK IT OUT! The small wooden chest was purchased from Hobby Lobby for $0.99, painted it black and added the jewel stickers. 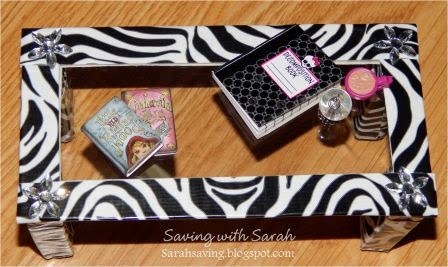 Little extras: Mirror, duck tape and jeweled stickers were all purchased at Hobby Lobby. 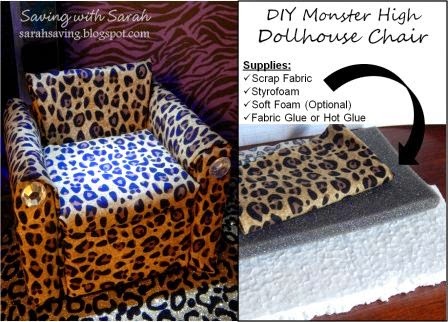 For the chair (and Ghoulia's couch) I just cut each section out of styrofoam; sides, back bottom and covered with fabric using hot glue. 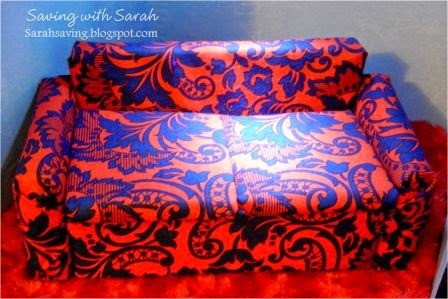 For the cushion, I covered a piece of soft foam in fabric. Then hot glued them all together - easy peasy! 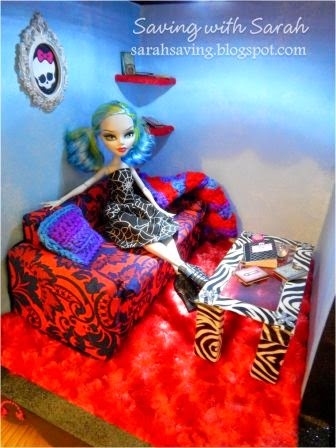 I used this tutorial from DollHigh to make Ghoulia's "glass" coffee table. The "glass" is made from the plastic packaging from the doll boxes! Little extras: The little books are charms (again, I removed the hooks) from Hobby Lobby. They have TONS of little charms that make great dollhouse accessories! 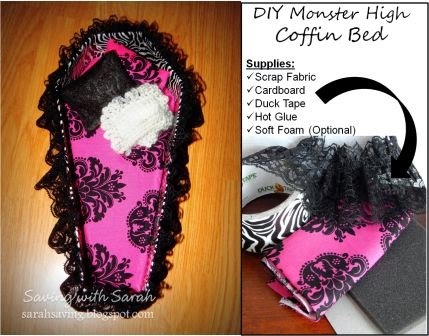 To make Draculara's coffin bed, I used cardboard to create the coffin shape and then covered in duct tape from the Dollar Tree (these are smaller rolls, but if you only need a little it's much cheaper than the craft store.) I then cut out some more of that soft foam for the mattress, covered in fabric and glued it to the bottom cardboard. I also added a some lace trim to spice it up! Since I ran out of time to make a proper closet, I used some Dollar Tree pill boxes for extra shelving. Just cut off the lids and covered the sided in glitter tape. This is absoluty amazing! I have wanted to make my daughter a dollhouse for a couple years now but back then, I envisioned a Disney Princess dollhouse. 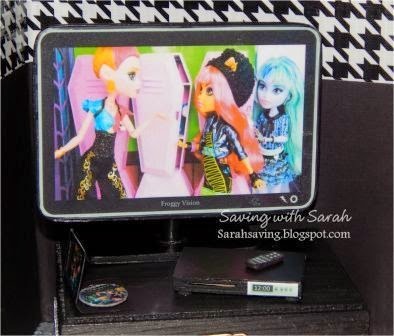 Thank goodness I never got around to it cause now she is in love with everything Monster High. 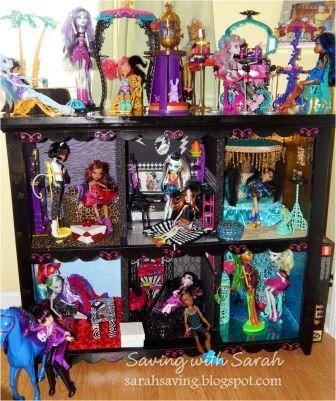 This is amazing, everything you have done for this dollhouse! 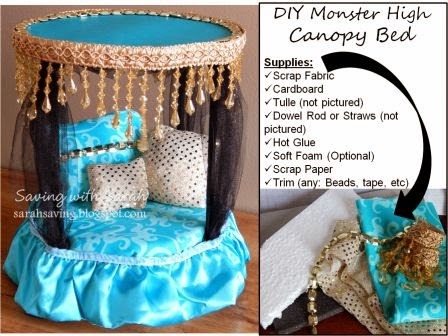 I am going to be creating something similar for my daughter for Christmas and I am certain this tutorial will be needed. Thank you so much for this tutorial and the inspiration to actually go through with my project. My daughter is going to love it! Thank you so much Christina! Definitely get started right away - everything took twice as long to finish as I originally estimated. I'm sure your daughter will love it! Thank you for the ideas here!! 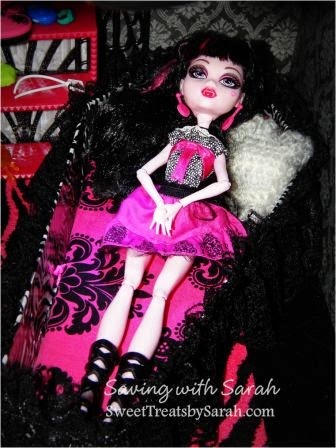 I've been on a search for ideas on how to make a house for my daughters MH dolls. Thank you!